How can I transfer multiple files at once over Bluetooth? 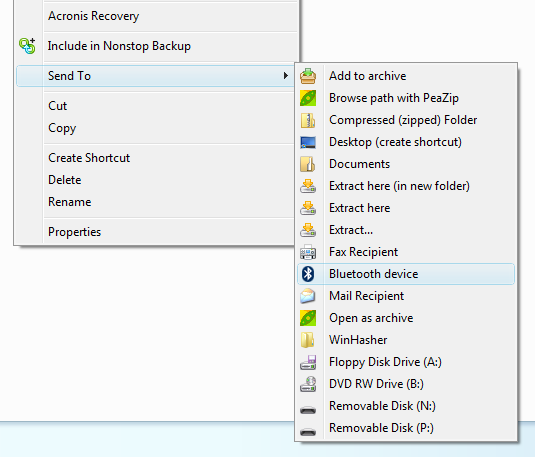 How can I transfer more than just one file at a time over Bluetooth from my desktop PC to my mobile phone? I have paired the two devices and I can send files from my PC to my phone, but only one file at a time. What I normally do is, when the phone is in range, I right click a file on the PC and select Send To from context menu and then click Bluetooth. I then choose the device I want to send to and click Next. 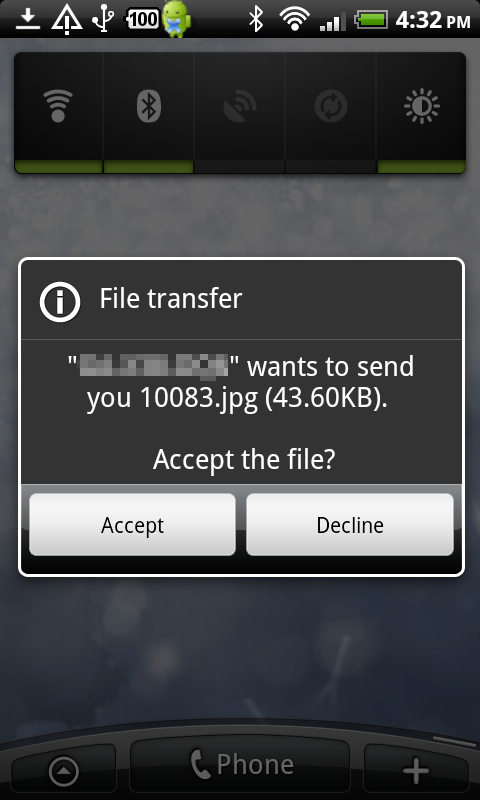 I get a prompt on the phone asking me to receive the file or not. I accept it and the file is received. But if I wanted to transfer like 150 files this way that would be very tiresome. I'm sure there must be a better way to utilize file transfer over Bluetooth. As I recall there used to be an icon for my Bluetooth connected mobile phone in the Computer view (Win+E) in Explorer in Windows Vista. I was able to double click on it just like you would do with a mounted USB flash drive or any HDD drive. It allowed me to browse its contents and transfer files over Bluetooth to and from this device. I think this was when I had a Nokia smartphone. I just assumed it was part of the Windows system... but maybe it was part of the Nokia sync tool... or is it? How can I replicate this? Is it possible to have an icon for a connected Bluetooth device in the Computer view that you can click and browse and drag and drop files onto when the device is in range?... I would like to have this feature back, this time with this HTC phone. 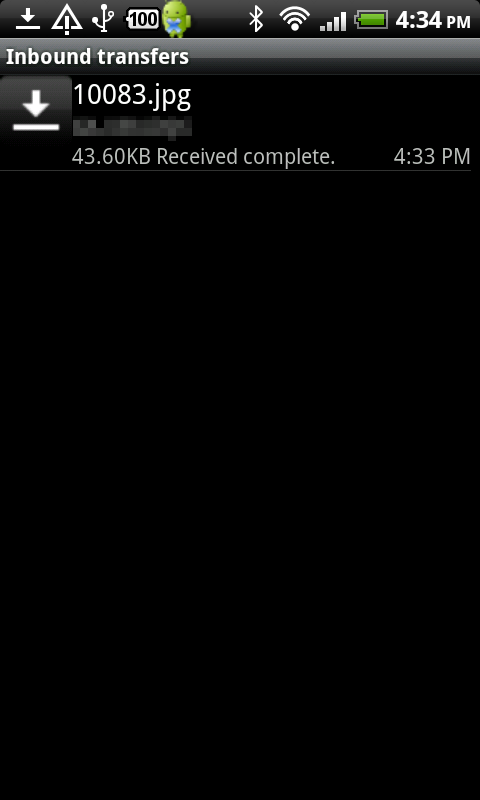 I usually don't use Bluetooth for file transfers, simply because it's so slow. But sometimes it is just right, for smaller files of course, and I'm in a hurry and don't want to go get my USB cable or don't know where it is. But clicking and tapping through each file transfer is just not gonna work for me. It's OK for 2 or maybe 3 files, but for 10 files or more I give up. If this is a duplicate question, let me know and please point me to the question that covers this issue and I will delete this one. If you need more information please add a comment. I will respond as quickly as I can. If I right-click a folder and choose Send To, and then Bluetooth, Windows Vista just shows an info box stating that this operation is not possible. It says I cannot use Bluetooth File Transfer (I think is the generic name of this feature) to transfer folders. It then suggests that I open up that folder, select all the files in it and then send them to the device that way. 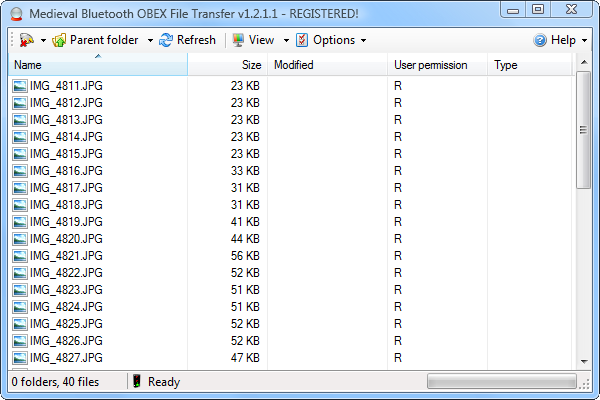 There is a software tool for PC called Bluetooth File Transfer. The current version is 1.2.1.1 and it's made by a company called Medieval Software from Italy. I am not exactly sure what the license status is for this software, but it seems to be freeware. Or is it shareware? If you know more about this please post a comment. 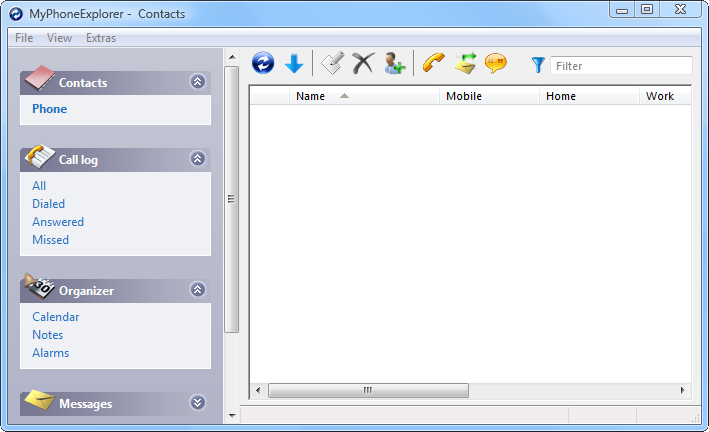 This software uses OBEX protocol for communicating with the phone. 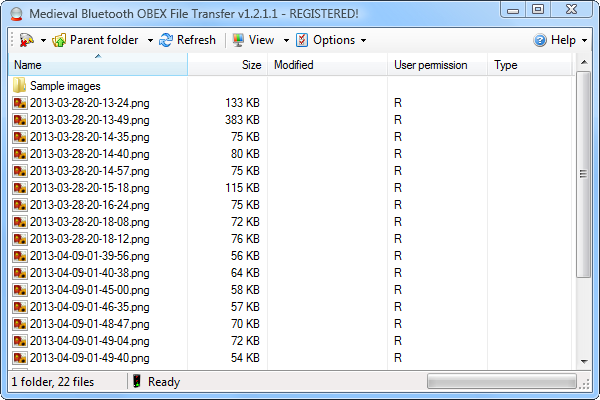 For it to work the phone needs to support Bluetooth FTP profile (File Transfer Profile). Not to be confused with FTP (File Transfer Protocol). Here's how you will use it. Install the software, of course. You can download it from the authors' website. There is an Android version and a Java version (Java2ME). Make sure you click the PC version. The link above points directly to the page for the PC version. Make sure you have paired your Android phone with your PC. I won't go through the steps here. I will assume you have already done so. Make sure Bluetooth is enabled on your phone and make your phone discoverable. Also make sure Bluetooth is enabled on your PC. Enable FTP profile on the phone. 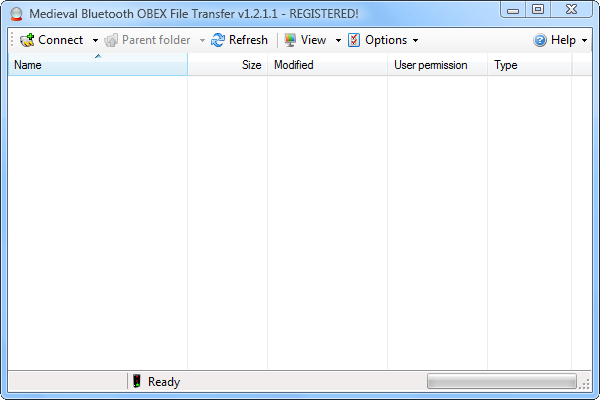 Start Medieval Bluetooth OBEX File Transfer and click the Connect button on top left. 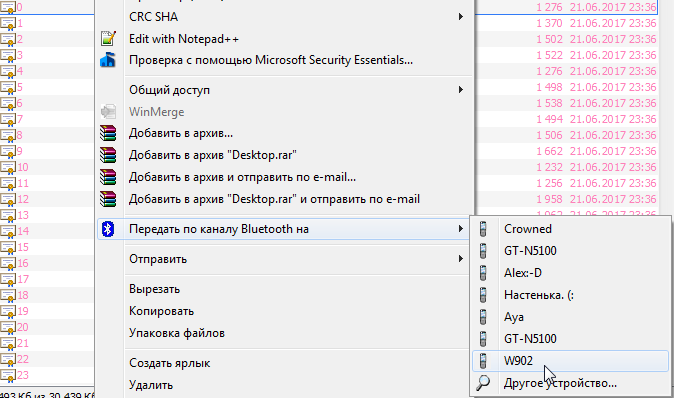 You will see a new dialog called Bluetooth Network. While your phone is still discoverable, click the Refresh button and wait. It will scan for Bluetooth devices. It will only find it if your phone is not too far away from the PC, and the phone needs to be set to discoverable. Most Android phones have a timeout for how long they stay discoverable. That's usually 120 seconds or 2 minutes. You have to click this button within that time frame. If it times out you need to make it discoverable again. 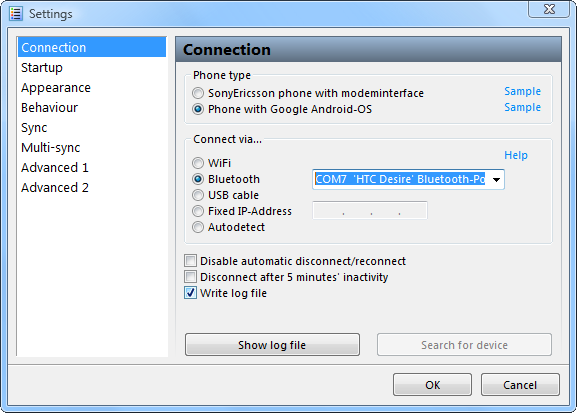 When you see your phone in the Bluetooth Network dialog, mark it and then click the "Accept selected device" button. The PC should now connect to the phone and you should be able to browse its contents. To copy one or several files from the PC to the phone you can just drag one or multiple files, or a folder with files, and drop it on the folder where you want to copy it. 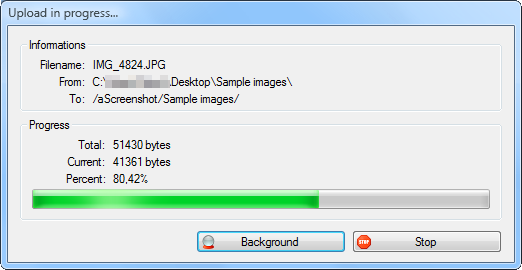 In the images below you can see how I am copying 40 JPEG files from Desktop to the phone. This tool does not integrate with the Windows Shell, so there is no option for it on the Context menu or an icon in the Computer view (Win+E). So you have to start the software and connect to the phone each time. But the best thing is that once you are set up you can browse the phone contents and copy multiples files to and from the phone with simple drag and drop. You might be able to put all the files into a .zip then extract them when they are at their destination. 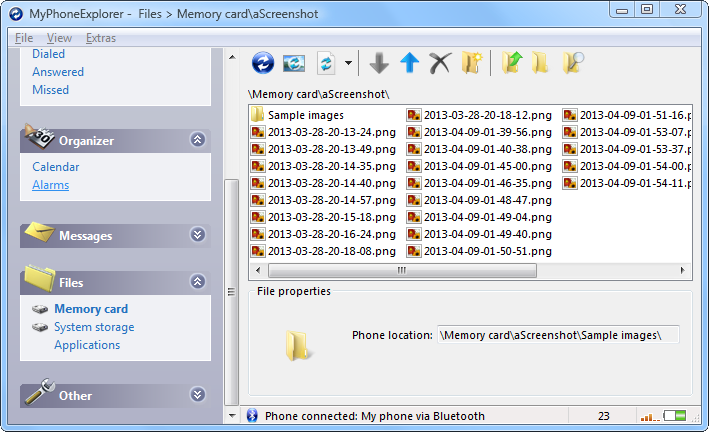 Another software tool I found to be even better is called My Phone Explorer. I like this one better because it not only lets me connect to the phone over Bluetooth but also over WiFi. It also works with USB connection. This one is not just a file transfer tool. It is more of a sync tool for syncing all your messages, calls and contacts, in addition to a file transfer feature. So if you only want file transfer over Bluetooth then use the Medieval Software tool. If you want more options then use My Phone Explorer. For this tool to work you need to install the My Phone Explorer app in your Android phone. This app needs to be running in the foreground or in the background, in order for the PC tool to find and communicate with the phone. You may want to consider that before you decide which tool to use. Install My Phone Explorer on the PC. You can download it from the developers website here. The current version is 1.8.4. They are using DownloadBestSoft.com for hosting the files. Just saying, don't let that scare you off. In fact, here is a direct link to the EXE file for download. This link may not work in the future. Install the Android app. You can download it from Google Play Store on your phone or push it to the phone from the website using your PC. If you don't install the Android app on the phone I think the PC app will ask you to do so, or maybe install it for you once you connect the phone to the PC for the first time, I don't remember exactly, but you will need the Android app in either case. Once again, enable Bluetooth on the phone and make it discoverable. Also enable Bluetooth on the PC. And again, the two need to be paired and ready for connection. 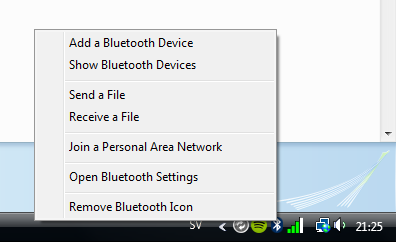 Open the Bluetooth settings dialog on your PC. On Windows Vista you will do that by right-clicking on the Bluetooth icon that sits in the task bar and then clicking "Open Bluetooth Settings". This brings up a dialog called Bluetooth Radio Properties. 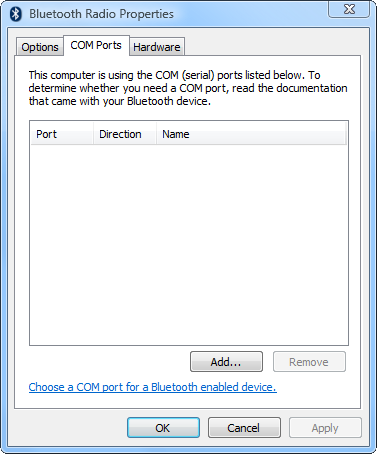 In the Bluetooth Radio Properties dialog, click the COM Ports tab. Now click the Add button. You should see a new dialog called "Add COM Port". In here you want to select "Outgoing" radio button, and then select your phone from the drop down menu. In the Service field you will see "MyPhoneExplorer". 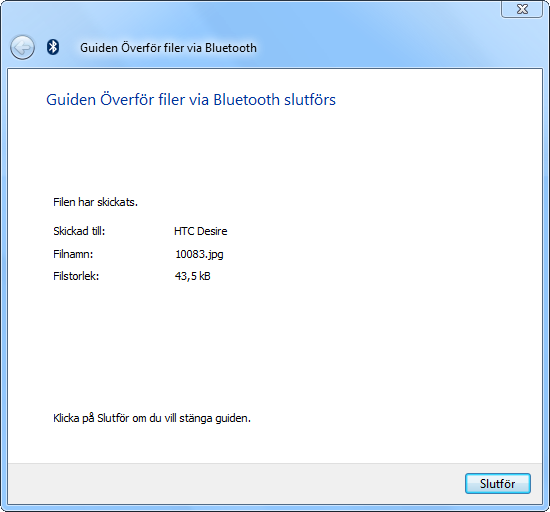 Now just click OK to close it, and click OK again in the Bluetooth Radio Properties dialog to save the changes. Start My Phone Explorer app on your phone. It will say "Starting client" on the notification bar. The app interface may not appear at first. To show it just tap the app icon once again. Start My Phone Explorer on the PC and go to File, Settings. 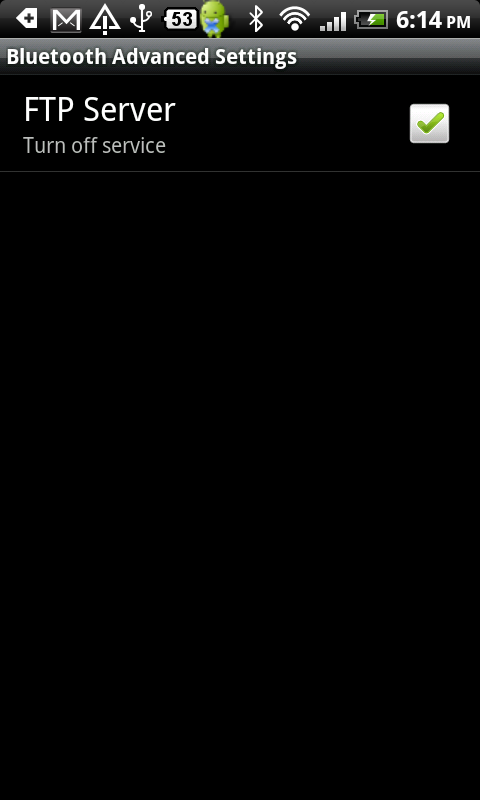 Under Connection, click the option "Phone with Google Android OS". Then click Bluetooth radio button and click and choose a COM port number from the drop down menu or just type it in. This must be the same COM port you installed earlier. Click OK to save. It will now ask you to choose a name for the identified phone. Frankly I don't know how this works. It recommends using My Phone Explorer for syncing the phone, so it's not really mandatory, but at the same time you can't click the Cancel button unless you type something in the field. So I'm not sure what they want with this. Just type in whatever you want, I used "My phone". It should start connecting now. If it does not do that just click File and then Connect. Once connected it will by default start syncing with your phone (i.e. copying contacts, calender data, etc.). You can change this in the settings, like when or what to sync, etc. Click the double arrow button where you see a folder icon and where it says "Files". You now have the choice of browsing either the memory card or the system memory. In the example above you can see a list of the files I previously copied using the Medieval tool. Copying to and from the phone works the same way here. Drag and drop is supported here as well. The setup for My Phone Explorer is a little more complicated than with Medieval Software tool. 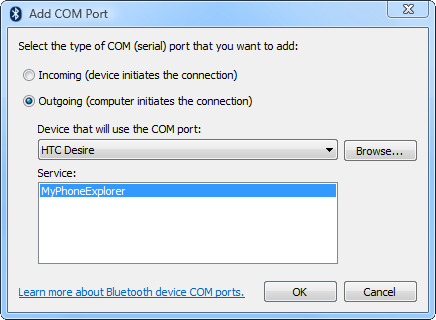 For starters, you need to set the COM port to use and install the MyPhoneExplorer service for it. This part was not very obvious to me at first, and there is little mention of it in the instructions. I carefully followed the on-screen instructions of how to set up the PC part of the tool. They only tell you to choose a COM port in the settings, but they don't tell you how or where to actually install the service and the Bluetooth COM port. So it was giving me different error messages at first. But I eventually figured it out on my own and it works now. Remember, if you are using a third party Bluetooth stack/software like Toshiba or BlueSoleil you may need to set the COM port there and not in the Microsoft Bluetooth stack as shown above. Once you have set it up it's pretty easy to use My Phone Explorer. You may need to change the settings in the software when you switch between connecting with Bluetooth and WiFi. There is an Automatic option, but doesn't seem to work properly with my phone. If you decide to try the WiFi connection, the Android app will tell you to set a PIN code for the WiFi. Don't confuse this with your pre-shared key for your WiFi network, they are not the same thing. This is just something you will use with My Phone Explorer. I recommend you set this PIN code for added security. I have found success with a program called Obex Commander. You use it in a similar way to Windows Explorer. 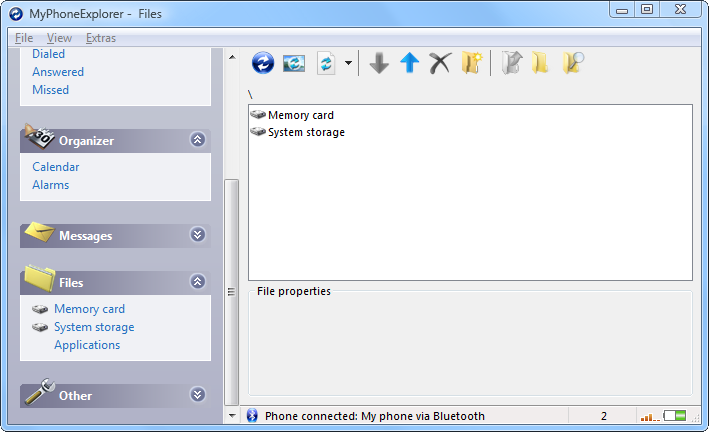 I found it really easy to use plus it has support for Microsoft's, Widcomm and Toshiba Bluetooth stacks out of the box. And you can not only connect to your mobile bluettoth device via bluetoth, but you can also use USB and even Infrared! Once successfully paired to the device you can drag and drop the files into the right window and they will appear in the mobile device. You can also remotely delete files which are on the paired device. Of course, if it's root certificates, you'll still have to confirm installing each one into certificate store in the phone's UI - but since confirmation dialogs will appear automatically, that's not a big problem. Not the answer you're looking for? Browse other questions tagged windows-vista bluetooth file-transfer mobile-phone or ask your own question. Why can't I send files via my laptop's bluetooth? How can I transfer photos and files from Nokia 2760? 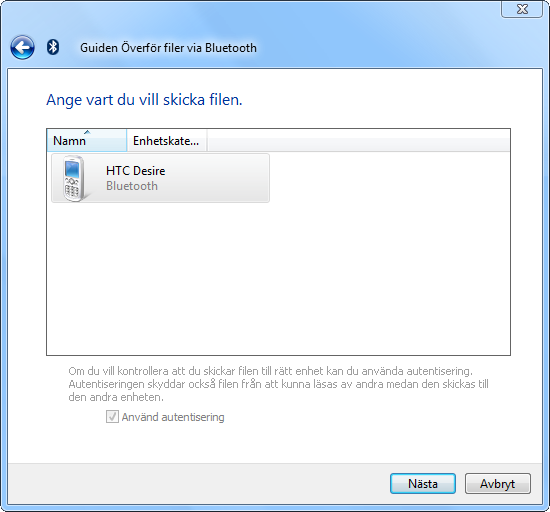 How to browse Bluetooth files to or from Windows® 10 without third party apps? How can I receive files via Bluetooth without first requesting to receive them?